Mention the word archaeology to someone and they are as likely to think of a certain whip-cracking, fedora-wearing hero as they are of long, drudging digs and museums full of dusty tomes and broken trinkets. Pergamon – set in the late 1800s during the height of the Pergamon excavation in Turkey – is less about whip-cracking and much more about all that digging and dust. However, for a game that’s all about unearthing artifacts from long-dead civilizations, Pergamon’s play exudes a surprising amount of life. The galleries, where goodies are found. 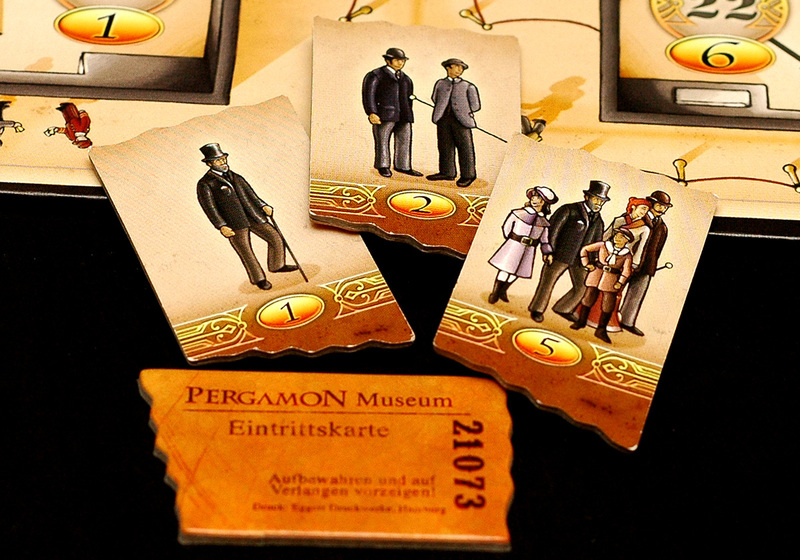 In Pergamon, players assume the roles of archaeologists charged by the Royal Museum of Berlin to excavate prized pieces of antiquity at the famous titular site. The player who is best able to manage available funds, assemble the most astounding artifacts, and garner the most attention of the museum-going public wins the game. The game is played out over 12 rounds, represented by a calendar that marks off the months of 1878. At the beginning of each round, five tiles representing pieces of certain artifacts are revealed and laid out vertically along the gallery levels according to their age. Older artifacts are more valuable and will be worth more points when exhibited at the museum. The heart of each round, and the true jewel of the game, is the jockeying for position along the funding track. 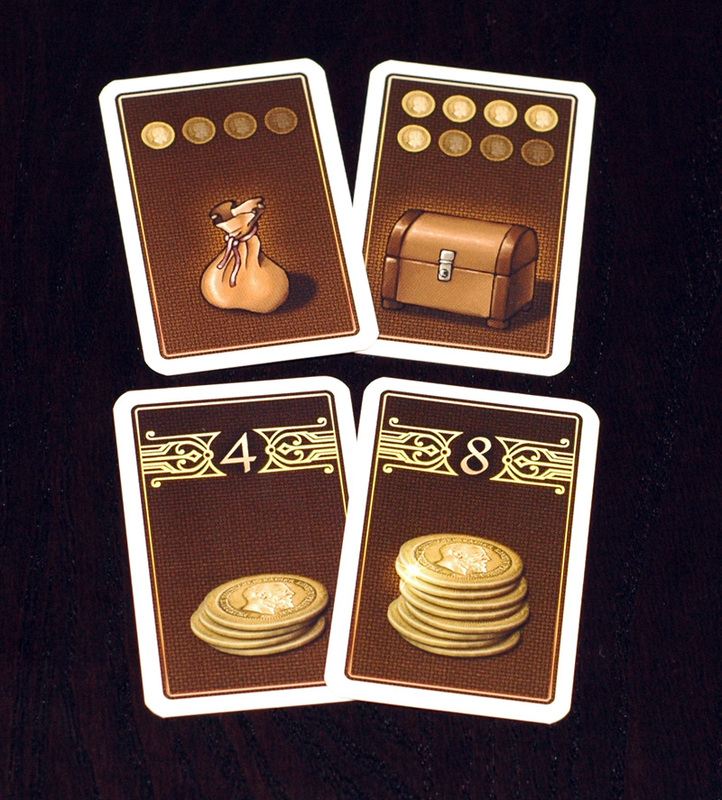 Fund cards are revealed each round; on their backs is either a money bag (which may supply from 1 to 4 coins) or chests (which may supply from 5 to 8 coins). Players then take turns placing their archaeologists on one of the 13 spaces on the funding track. Each space typically shows a number of coins that a player may collect, along with numbers corresponding to gallery levels that the player is allowed to excavate. The funding track also determines order of play; the player with the archaeologist on the spot to the farthest right of the track will excavate first, then play will proceed down the line. 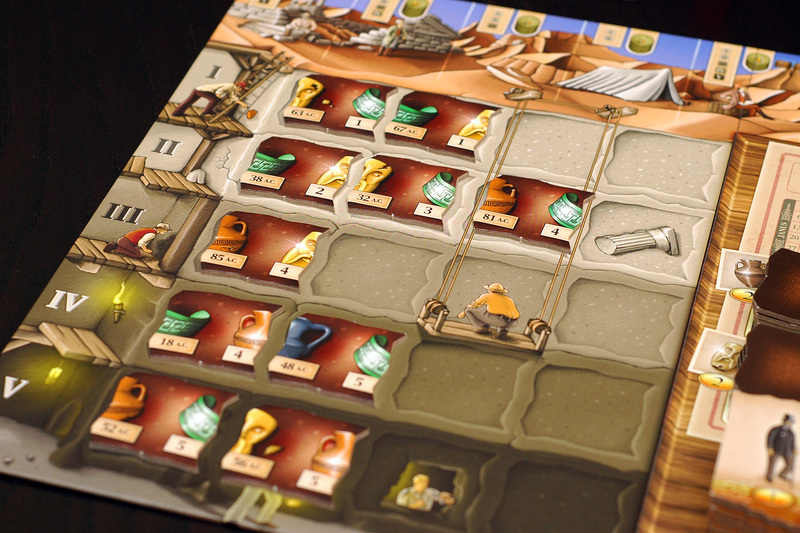 The figure that is farthest to the left goes last in excavation, but they also have the advantage of being the first player to place their archaeologist in the next round. The funds track... the heart of Pergamon. Funding is like a box of chocolates... you never know what you're gonna get. The amount of funds distributed can also be a gamble, depending on placement. The spaces to the right of the funding track grant fewer coins, but it is more likely that players will receive what they ask for. The spaces further down the track have more coins, but after the fund cards are revealed and coins distributed, players on these spaces may not receive funding. The opposite could also hold true; any coins left over after funds are distributed go to the player whose archaeologist occupies the last space on the track. Obviously, figuring out the best placement on the funding track is the most important (and often riskiest) decision of the game. Once players excavate a few artifacts and match the art on their tiles, they may choose to place an exhibit in the museum. Placement in the museum is dependent on the total age of the finds in that player’s exhibit; the higher the placement, the more victory points a player is likely to receive during one of the four evaluation rounds distributed throughout the calendar year. As time progresses, and more exhibits are added to the museum, exhibits placed in earlier rounds will move closer and closer to the front of the museum as the public loses interest. Eventually, many exhibits will be removed from the museum altogether, denying that player any further victory points. Piecing together the finds for an exhibit. Players may receive bonus victory points if they have the oldest vase, urn, mask or bracelet during certain evaluation rounds, and extra compensation is dealt out at the end of the game for each archaeologist that has the first, second and third-oldest exhibits in the museum. Although I’ve never been to Pergamon, I have visited the Pergamon Museum in Berlin. I’ve walked through the grand Ishtar Gate along King Nebuchadnezzar’s wall, and climbed the steps of the storied Pergamon Altar. It’s a stunning and humbling experience. Designers Ralf zur Linde and Stefan Dorra have been to the site of historical Pergamon, and, obviously moved by their visit, have poured amazing historical detail into the game design; from setting the game during the first year of major excavations in 1878, to including the four main types of relics rescued: vase, urn, mask and bracelet. That detail, and the heartfelt admiration evident from designers and producers of Pergamon, make this compact and accessible exercise in archaeology worthy of exhibition among the classics. Overall, gameplay is pretty straightforward and easy to explain. The game recently passed the “non-gamer” test, as we hosted a couple of our friends that aren’t heavily into boardgames, and it only took a couple of rounds until they were being competitive and getting into the spirit and theme of the game. The tactical thinking involved with placement along the funding track each round keeps Pergamon lively, and ramps up both the sweat and punk factors. Cursing is not uncommon. Also, gameplay with two players is just as smooth as with three or four - the use of the dummy “tomb raider” is unobtrusive and will have most gamers cursing just as much at that tiny bit of wood as they might with those players made of flesh and blood. Replay is fairly decent, as both the funding cards and the artifact tiles are randomized each game. However, this is far from the deepest game in the Dice Hate Me library, so replay could grow slim if anyone is forced to play with the same group multiple times. As mentioned above, the amount of detail and the respect afforded that detail makes Pergamon a pretty special gaming experience. The theme is unique and magnificent. The artifact tiles and game board are sturdy and brilliantly-illustrated by veteran artist Klemens Franz. However - as nit-picky as this may be - the blues in the exhibition tiles and archaeology figure aren’t even close to matching. I am reticent in mentioning this discrepancy, but with so many games being produced with close attention to production, I can’t grant a perfect score for components when there is a lack of perfection in the box. Oh yes, Pergamon is fun. It’s not edge-of-your-chair cheerful or suspenseful fun, but there is exhilaration in the perfect placement of your archaeologist that results in excavating just the right pieces for your exhibition. There is also the same exhilarating experience in blocking one of your opponent’s winning moves with careful placement along the funding track. As mentioned earlier, it is this careful jockeying along the funding track - the cat & mouse roustabout that can occur between one or more opponents - that really fuels the fire and the fun in this game. Overall score: 15 out of 18 - This may not be the holy grail you’ve been digging for, but you’d be hard-pressed to find a better jewel amongst the many half-completed artifacts in today’s board games. Victory points, in the form of tickets to the museum. Is it just me, or do they look like tiny graham crackers with a bite taken out? Just me? Ok, then. As polished as the final version of Pergamon seems to be, I would be remiss if I failed to mention some of the mistakes present in the English version of the game. For instance, the rules for end-game scoring are not very clear – the wording is off. The rulebook states that the “player who owns the oldest exhibit at the museum receives 3 victory points…” and so on and so forth. The wording should read that the player who owns the oldest item on current display in the museum, or oldest find in a collection on display in the museum. Another mistake in the rules lies in Variant #1 – the wording relates to the order in which players take their turns depending on their placement along the funding track. According to the variant in the rulebook, the player who placed their archaeologist on the last space on the funding track gets to place their figure first in the next round, and then play continues clockwise around the table. The rulebook should state that player figures are placed on the order track on the side of the board – marked 1 through 4 – depending on their placement along the funding track. We have found that this variant makes a huge difference in gameplay with three or four players, so we recommend making this an official rule, rather than a variant. 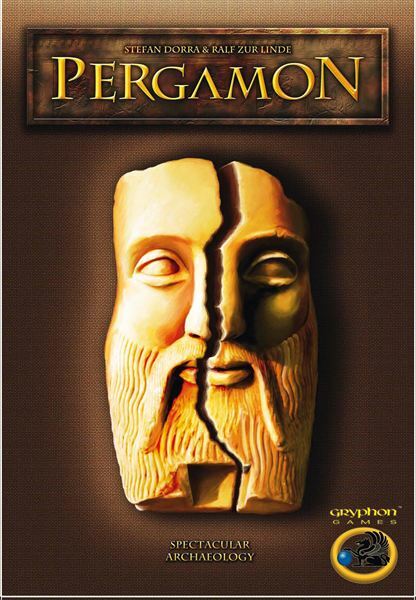 Pergamon is a game for 2 to 4 archaeologists, ages 10 and up, designed by Ralf zur Linde and Stefan Dorra for Gryphon Games. 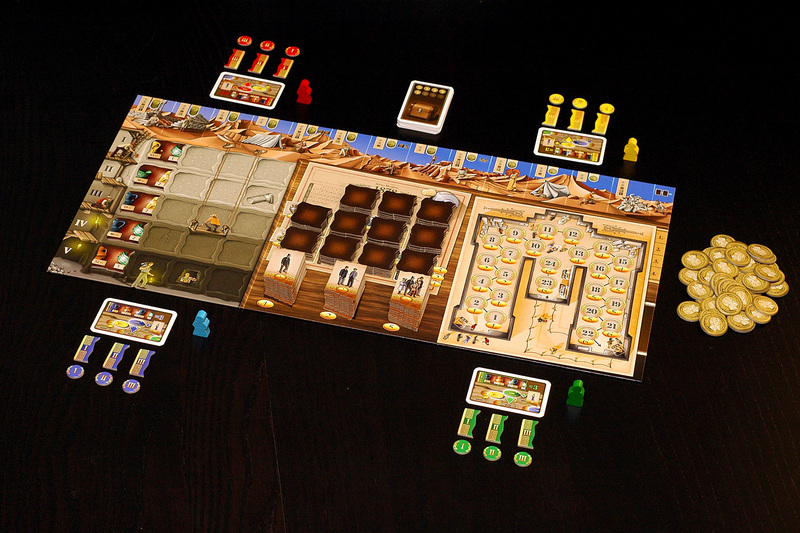 You can purchase Pergamon from Funagain Games for $32, or from your favorite local game store. Did you know that when you buy from Funagain Games that you’re helping out this site? It’s true! 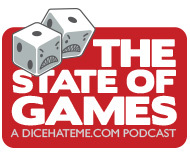 Get games, help out your favorite blog. It’s win/win!